Chino’s dominance can’t be confined to Southern California. 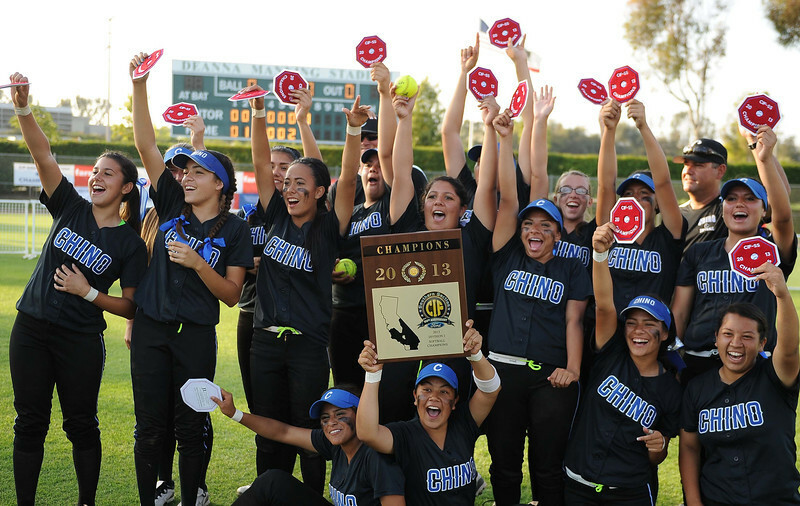 The juggernaut softball team that claimed its second consecutive CIF-SS Division 2 championship on Saturday, was named the Division 2 state softball team of the year by Cal-Hi Sports. Here is the photo gallery from the historic 4-0 win over Lakewood. Chino finished fourth in the state rankings last season, but a season that included just two one-run losses vaulted the Cowgirls to the top. And they’re not done yet. Utah-bound pitcher Miranda Viramontes will return for her senior season along with four freshman who played prominent roles this season. Mission Viejo, one of the two teams to which Chino lost during the regular season – Viramontes, however, didn’t pitch in the Cowgirls’ 7-6 loss March 9 – was the overall state No. 1 entering the playoffs. The No. 1 seed in Division 2 fell to Ayala. Coincidentally, Ayala was the last local team to end the season as Cal-Hi Sports’ overall No. 1 team in the state when a Jessica Hall-led squad won a CIF title. CIF-SS Division 1 champion Corona Santiago won top honors in the state this season. Below is a complete list of all-time Cal-Hi Sports state softball teams of the year.